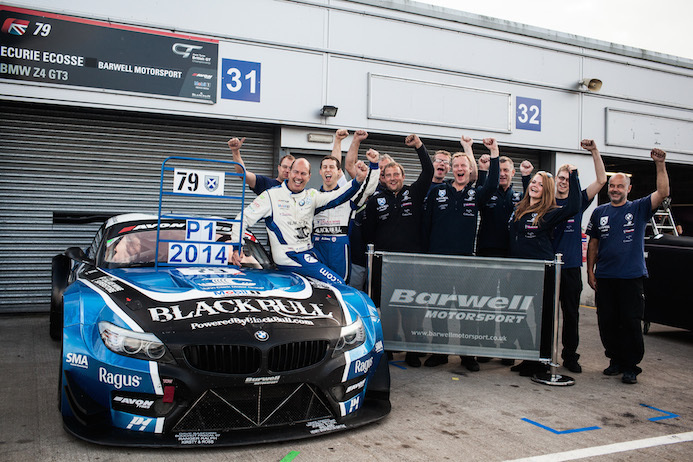 Ecurie Ecosse Powered By Black Bull’s Marco Attard is the new Avon Tyres British GT champion after a nerve-jangling afternoon was spent largely on the sidelines at Donington Park’s season finale last weekend (September 13/14). Despite the legendary Scottish squad’s Barwell Motorsport-run #79 BMW Z4 GT3 suffering only its second non-finish of the season at the two-hour event, Attard’s significant points advantage was enough not only for him to scoop the 2014 Driver’s title but also claim the Blancpain Gentleman Driver Trophy for best-placed Amateur. Co-driver Alexander Sims was less lucky however, as the non-score relegated him to a still-impressive third in the standings after missing a round earlier in the season. Ecurie Ecosse also finished third in the Teams’ standings having comfortably outpaced the other single-car entrants throughout 2014. But the weekend and season undoubtedly belonged to Attard who, along with Sims and Snetterton supersub Jonny Cocker, claimed no fewer than four pole positions, three other front row starts, two race wins, two second places, a third and two fourths from the 10 races staged. Indeed, the final front row start came at Donington courtesy of a combined lap just 0.003sec shy of pole position, which was snatched away by arch title rivals Oman Racing Team in the dying moments of Attard’s Am session on Saturday afternoon. But with no success penalty to serve during their mandatory race pit-stop, the team were still confident of at the very least matching their rivals, who had no option but to win and hope Ecurie Ecosse finished seventh or lower if they were to steal the title at the death. Their chances of doing so received a boost after Sunday morning’s warm-up however, when a cracked cylinder head prompted the Barwell and BMW mechanics to perform a record-breaking engine change in time for the race. Incredibly the Z4 GT3 was ready before the start, only to then suffer a related gearbox problem that forced Attard into retirement while running second after just nine laps. The entire squad then watched on nervously as the Oman Racing Team Aston Martin held its lead, first with Ahmed Al Harthy and then Michael Caine at the wheel. It was still there as the race entered its final stages before finally being overhauled with just 15 laps remaining. Eventually slipping to fourth on the road meant Attard was champion by 10.5 points. Alexander Sims: “What a fantastic season this has been! Understandably we were disappointed with the way the race panned out for us at Donington, but our pace was excellent and a win really was on the cards. Marco and the team have done a superb job all year though, and we built up a very good points cushion heading into the final round that enabled him to clinch the title. All year it’s been really enjoyable to work with the team, who have put so much effort in. The British GT crown might be in the bag but Ecurie Ecosse’s 2014 season isn’t over just yet, as this weekend its Blancpain Endurance Series driver crew of Alasdair McCaig, Andrew Smith and Oliver Bryant attempt to claim the Pro-Am class Drivers’ and Teams’ titles at the championship’s Nurburgring season finale.